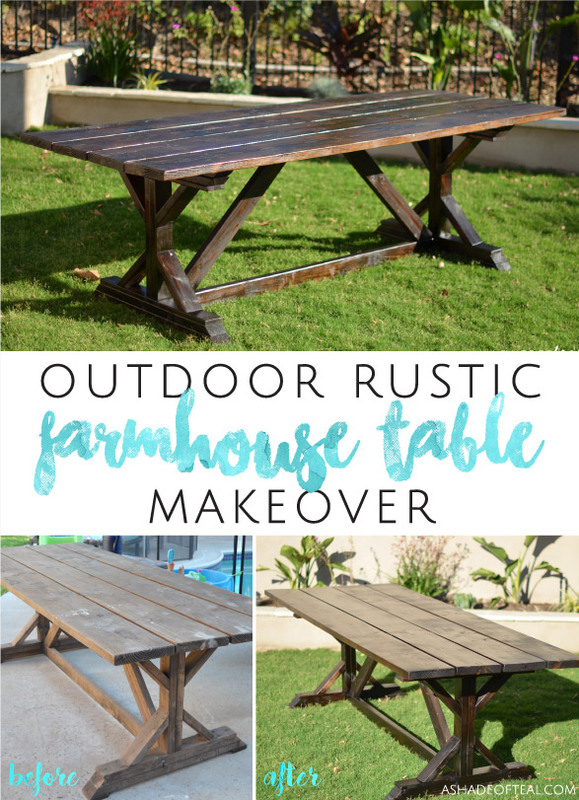 My backyard makeover is coming along, and my latest project has been giving my Rustic Farmhouse Table a makeover. The best part of this makeover was how EASY it was and how quickly it took! 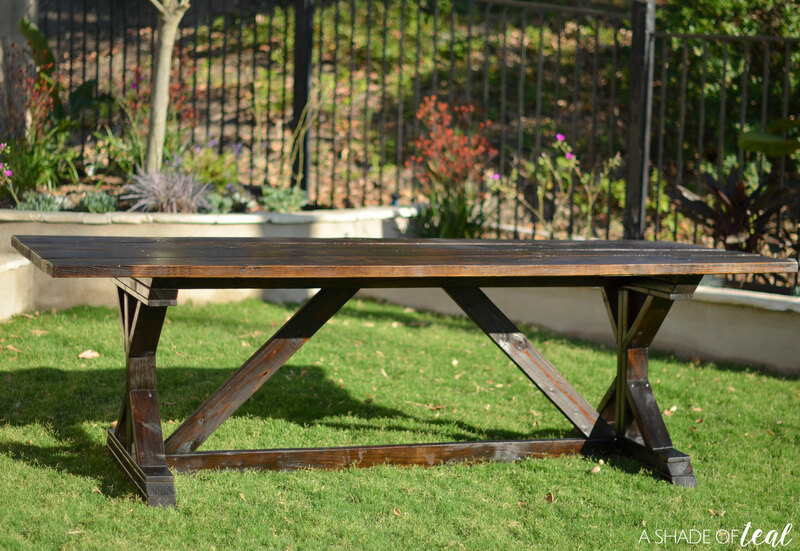 I built this table almost a year ago, read all about that here. Of course I never got around to sealing the table, but I guess having a baby is a good excuse for the delay! Well, after a year sitting in the sun it was due for a much needed makeover. Not to mention it kinda became a work table too. You can see all the damage I did with these before pics. 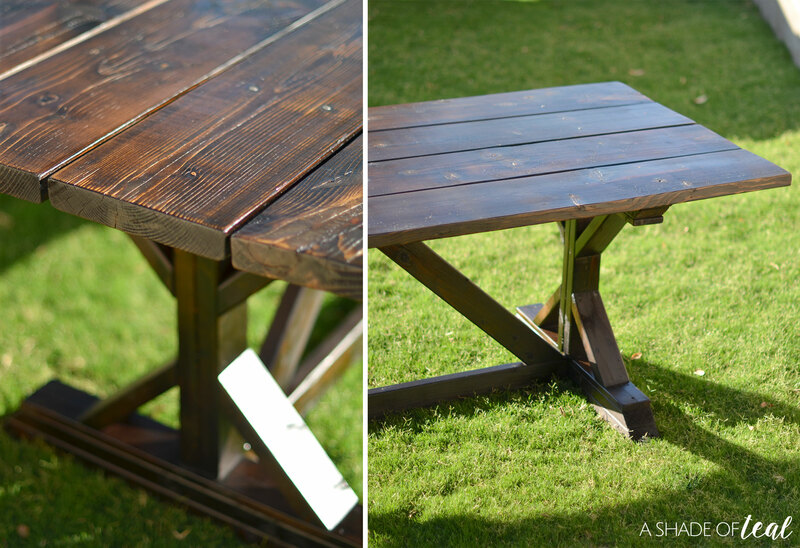 So here’s how I refinished my Farmhouse table. Step 1 // I gathered all my supplies including my HomeRight Finish Max Sprayer, my favorite stain color Minwax Dark Walnut, and the Polycrylic sealer. Step 2 // I sanded down the entire top with 120 grit sandpaper. The legs were not as bad so I didn’t bother sanding. Step 3 // I cleaned and dusted the entire table. Step 4 // Next I prepped my HomeRight Finish Max Sprayer by adding the stain. Step 5 // Then I started spraying! I started with the top and sprayed each piece of wood one at a time, then I came back and lightly wiped the wood to make sure the excess stain was well blended. Then, I moved to the legs and base. The entire thing took maybe 10 minutes to spray! 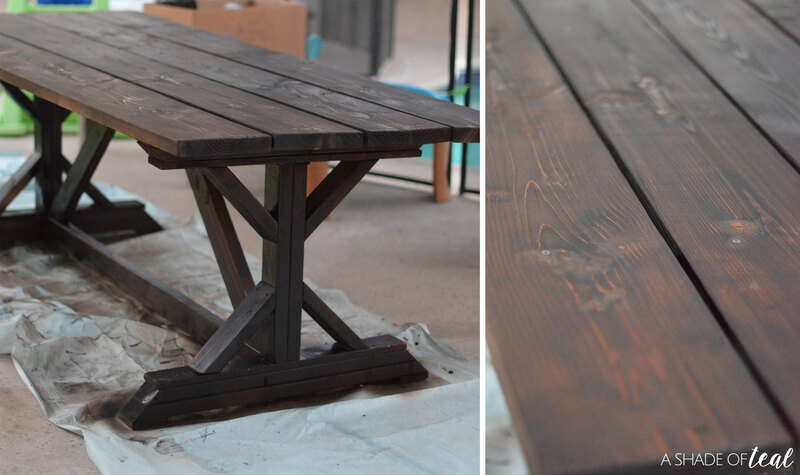 Step 6 // I let the stain dry overnight, but the transformation was already looking so much better! 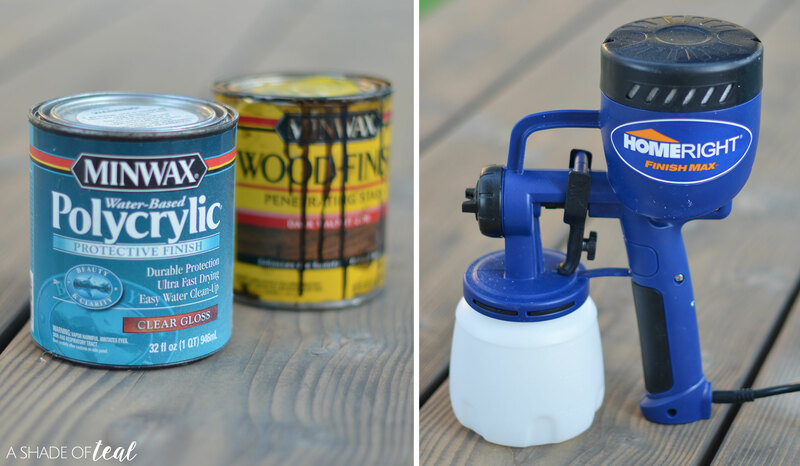 Step 7 // The next day I prepped the spray gun with the poly sealer. Step 8 // Finally, I added the 2 coats of poly. Each coat took only 10 minutes and I used a foam brush to clean up any excess poly that built up when I sprayed. I also allowed 2 hours between coats. I can’t wait to finally enjoy this table as it was meant to be. The Finish Max Sprayer is my new best friend! 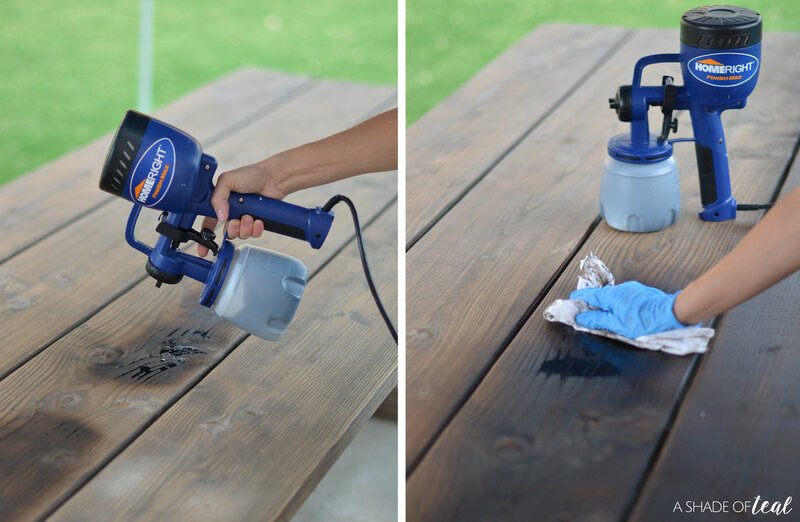 I’ve never used a spray gun for stain, and now I know I’ve been missing out. I can’t believe how easy it is to use and how quickly it got the job done. I think when I made this table a year ago, it took me a couple hours to stain it. But using the sprayer makes those hard to get areas no problem. 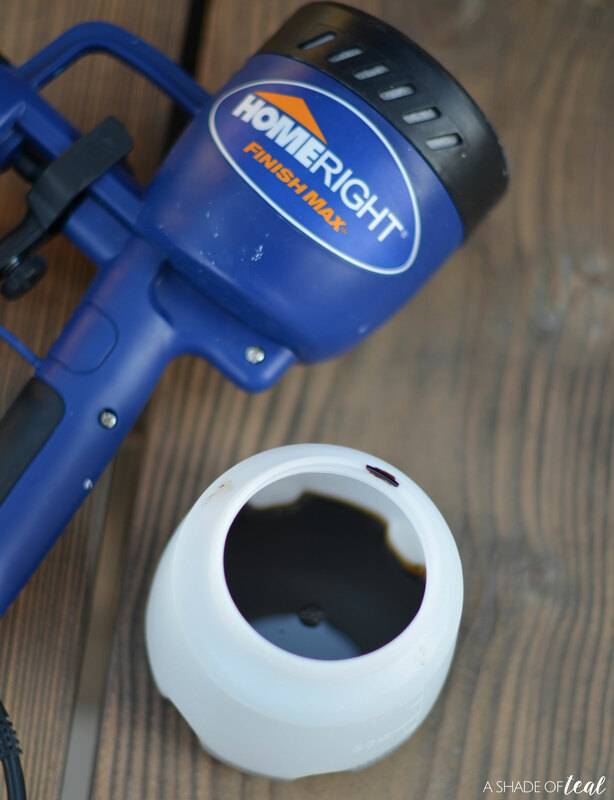 Go check out HomeRight for more DIY project tips and ideas. 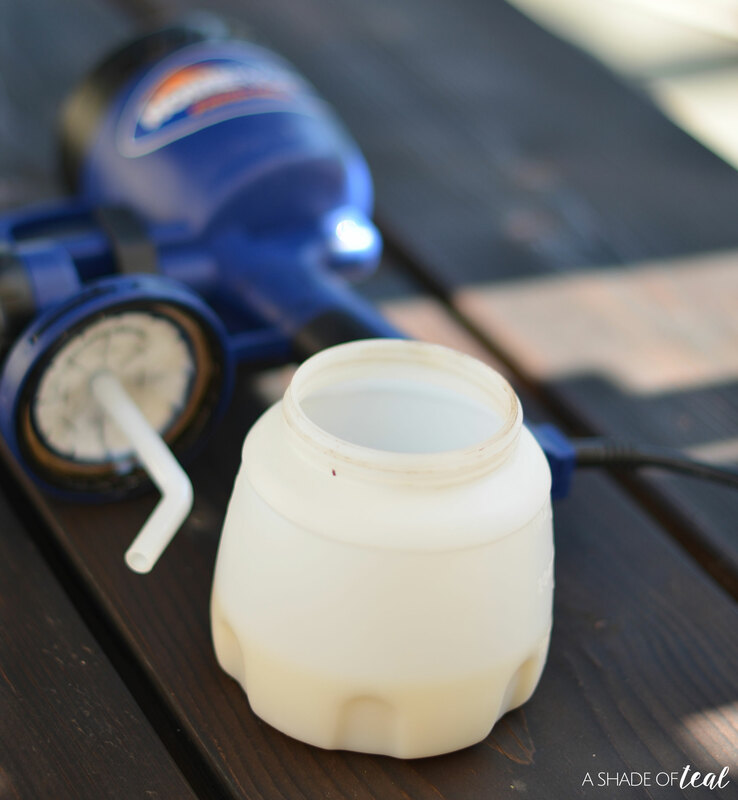 Or go pick up their Finish Max Sprayer here. « How to Easily add Patio Lighting Anywhere! Great DIY product. 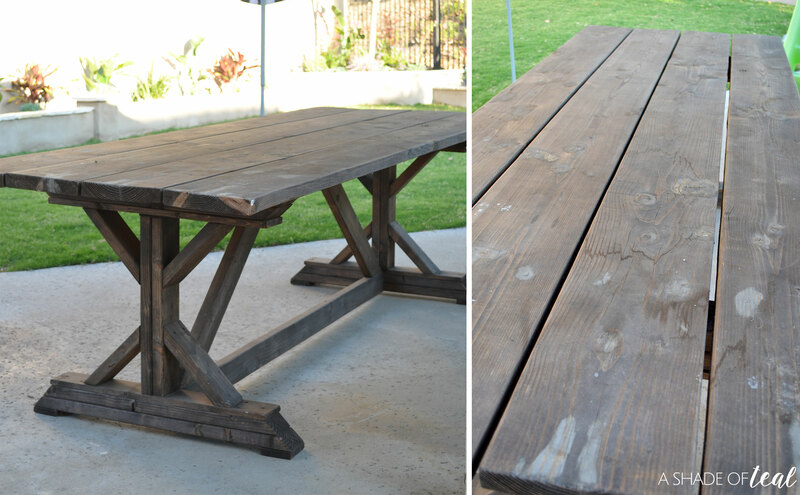 This such an great idea to restore furniture. Love it! I love seeing these different DIY posts. I think it’s amazing how you can turn something most people would have thrown out into a new piece! I truly wish I had a DIY bone in my body. I tend not to be handy in a lot of things. I loved this article thank you for sharing. 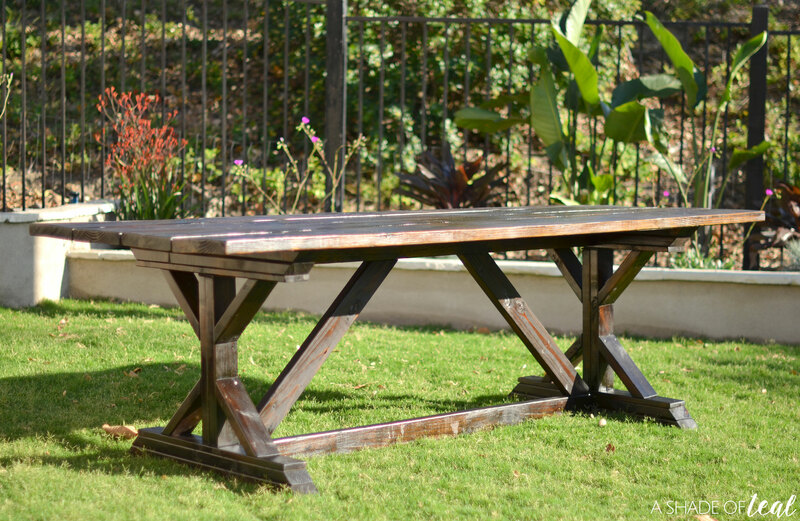 What a gorgeous table! You made that makeover look so easy! I love the dark color that you chose. That table is gorgeous. 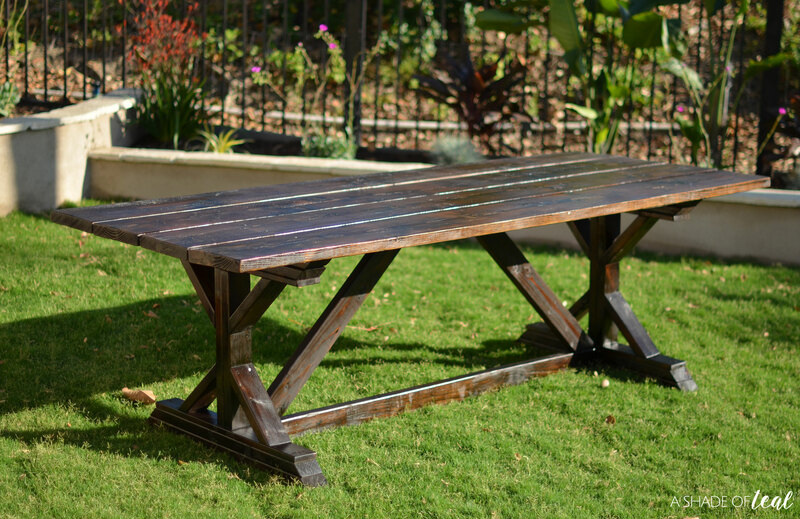 I would definitely have a farmhouse table if I had a yard, because I think it pulls together a yard. 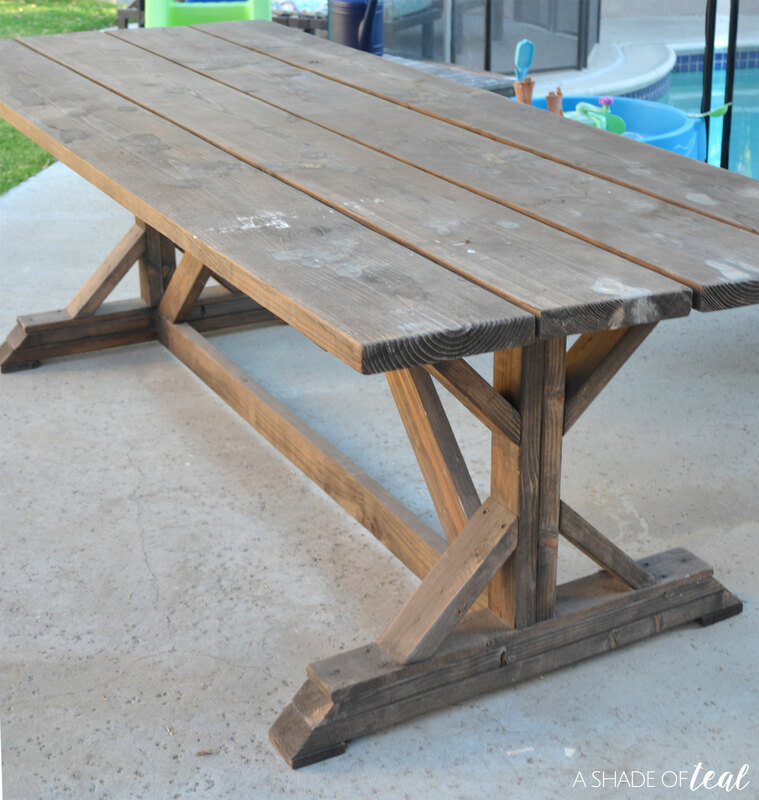 I love a good DIY project, the table looks great. I think it’s good to take a second look at something and see if you can turn it into something else before you decide to give it up. Just for building the table, you got mega props from me. I am also impressed by the extra work you did to finish it. Wow! This sounds great. You really did a great work to accomplish that. I love DIY! 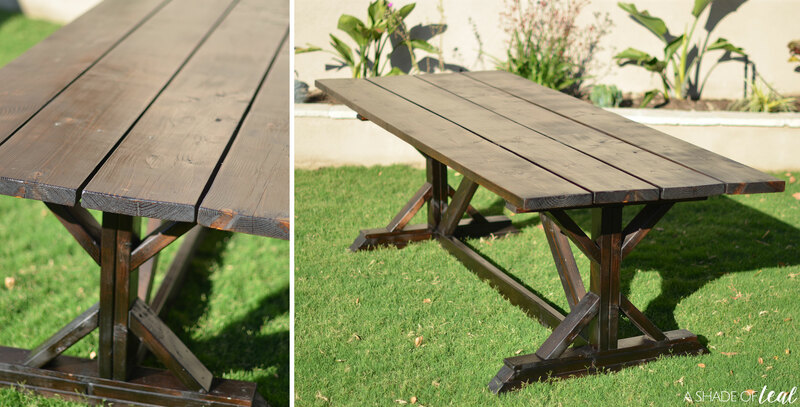 I usually spray paint items and get amazing results. Great project!